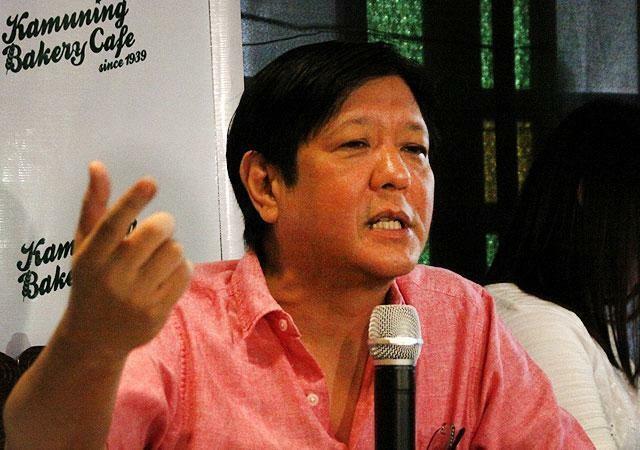 BATAC, Ilocos Norte – Vice presidential candidate Sen. Ferdinand “Bongbong” Marcos Jr. on Tuesday maintained that he will not apologize to the victims of human rights abuses committed under the term of his father, Former President Ferdinand Marcos Sr. during martial law. “I have already made my position very clear. I will apologize for any wrong that I may have done against somebody, that is always be my position and I will continue to hold that position,” Marcos told reporters at the sidelines of campaign activities. The lawmaker was reacting to the statement of a group of martial law victims, who are asking him to “issue a public apology to the Filipino people”. The group launched the “Campaign Against the Return of the Marcoses to Malacañang” or CARMMA. “CARMMA aims to torpedo the VP aspiration of Bongbong Marcos through public information and mass actions,” the group posted on its Facebook account. Marcos said that while he respects other people’s view that martial law should be held against him, he will not issue an apology. “Ganyan naman ang pulitika. Kahit naman sino ang tumakbo, kahit na sa anong posisyon ay merong kalaban, merong katunggali. Expected naman namin yan,” Marcos said. “And of course, we are prepared to answer any of the criticisms that they made or any of the question that they have for me,” he added. Marcos had earlier indicated that his family has nothing to apologize for. ”Will I say sorry for the thousands and thousands of kilometers that were built? Will I say sorry for the agricultural policy that brought us to self-sufficiency in rice? Will I say sorry for the power generation? Will I say sorry for the highest literacy rate in Asia? What am I to say?” Marcos said in an earlier interview.